Hubbard wrote one of Scientology's sacred texts, Dianetics: The Modern Science of Mental Health, in 1950. In it he introduced a crude psychotherapeutic technique he called "auditing." He also created a simplified lie detector (called an "E-meter") that was designed to measure electrical changes In the skin while subjects discussed intimate details of their past. Hubbard argued that unhappiness sprang from mental aberrations (or "engrams") caused by early traumas. Counseling sessions with the E-meter, he claimed, could knock out the engrams, cure blindness and even improve a person's intelligence and appearance. Psychiatrists say these sessions can produce a drugged-like, mind-controlled euphoria that keeps customers coming back for more. 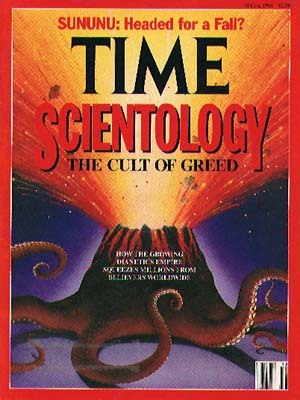 To pay their fees, newcomers can earn commissions by recruiting new mem- bers, become auditors themselves (Miscavige did so at age 12), or join the church staff and receive free counseling in exchange for what their written contracts describe as a "billion years" of labor. "Make sure that lots of bodies move through the shop," implored Hubbard in one of his bulletins to officials. "Make money. Make more money. Make others produce so as to make money . . . However you get them in or why, just do it." The church has invented hundreds of goods and services for which members are urged to give "donations." Are you having trouble "moving swiftly up the Bridge" -- that is, advancing up the stepladder of en- lightenment? Then you can have your case reviewed for a mere $1,250 "donation." Want to know "why a thetan hangs on to the physical universe?" Try 52 of Hubbard's tape-recorded speeches from 1952, titled "Ron's Philadelphia Doctorate Course Lectures," for $2,525. Next: nine other series of the same sort. For the collector, gold-and-leather-bound editions of 22 of Hubbard's books (and bookends) on subjects ranging from Scientology ethics to radiation can be had for just $1,900. CONSULTING. Sterling Management Systems, formed in 1983, has been ranked in recent years by Inc. magazine as one of America's fastest-growing private companies (estimated 1988 revenues: $20 mil- lion). Sterling regularly mails a free newsletter to more than 300,000 health-care professionals, mostly dentists, promising to increase their incomes dramatically. The firm offers seminars and courses that typically cost $10,OOO. But Sterling's true aim is to hook customers for Scientology. "The church has a rotten product, so they package it as something else," says Peter Georgiades, a Pittsburgh attorney who represents Sterling victims. "It's a kind of bait and switch." Sterling's founder, dentist Gregory Hughes is now under investigation by California's Board of Dental Examiners for incompetence. Nine lawsuits are pending against him for malpractice (seven others have been settled), mostly for orthodontic work on children. PUBLIC INFLUENCE. One front, the Way to Happiness Foundation, has distributed to children in thousands of the nation's public schools more than 3.5 million copies of a booklet Hubbard wrote on morality. The church calls the scheme "the largest dissemination project in Scientology history." Applied Scholastics is the name of still another front, which is attempting to install a Hubbard tutorial program in public schools, primarily those populated by minorities. The group also plans a 1,000 acre campus, where it will train educators to teach various Hubbard methods. The disingenuously named Citizens Commission on Human Rights is a Scientology group at war with psychiatry, its primary competitor. The commission typically issues reports aimed at discrediting particular psychiatrists and the field in general. The CCHR is also behind an all-out war against Eli Lilly, the maker of Prozac, the nation's top-selling antidepression drug. Despite scant evidence, the group's members -- who call themselves "psychbusters" -- claim that Prozac drives people to murder or suicide. Through mass mailings, appearances on talk shows and heavy lobbying, CCHR has hurt drug sales and helped spark dozens of lawsuits against Lilly. HEALTH CARE. HealthMed, a chain of clinics run by Scientologists, promotes a grueling and excessive system of saunas, exercise and vitamins designed by Hubbard to purify the body. Experts denounce the regime as quackery and potentially harmful, yet HealthMed solicits unions and public agencies for contracts. The chain is plugged heavily in a new book, Diet for a Poisoned Planet, by journalist David Steinman, who concludes that scores of common foods (among them: peanuts, bluefish, peaches and cottage cheese) are dangerous. DRUG TREATMENT. Hubbard's purification treatments are the mainstay of Narconon, a Scientology-run chain of 33 alcohol and drug rehabilitation centers -- some in prisons under the name "Criminon" -- in 12 countries. Narconon, a classic vehicle for drawing addicts into the cult, now plans to open what it calls the world's largest treatment center, a 1,400-bed facility on an Indian reservation near Newkirk, Okla. (pop. 2,400. At a 1989 ceremony in Newkirk, the As- sociation for Better Living and Education presented Narconon a cheek for $200,000 and a study praising its work. The association turned out to be part of Scientology itself. Today the town is battling to keep out the cult, which has fought back through such tactics as sending private detectives to snoop on the mayor and the local newspaper publisher. FINANCIAL SCAMS. Three Florida Scientologists, including Ronald Bernstein, a big contributor to the church's international "war chest," pleaded guilty in March to using their rare-coin dealership as a money laundry. Other notorious activities by Scientologists include making the shady Vancouver stock exchange even shadier (see box) and plotting to plant operatives in the World Bank, International Monetary Fund and Export-Import Bank of the U.S. The alleged purpose of this scheme: to gain inside information on which countries are going to be denied credit so that Scientology-linked traders can make illicit profits by taking "short" positions in those countries' currencies. BOOK PUBLISHING. Scientology mischiefmaking has even moved to the book industry. Since 1985 at least a dozen Hubbard books, printed by a church company, have made best-seller lists. They range from a 5,000-page sci-fi decology (Black Genesis, The Enemy Within, An Alien Affair) to the 40-year-old Dianetics. In 1988 the trade publication Publishers Weekly awarded the dead author a plaque commemorating the appearance of Dianetics on its best-seller list for 100 consecutive weeks. One legal goal of Scientology is to bankrupt the opposition or bury it under paper. The church has 71 active lawsuits against the IRS alone. One of them, Miscavige vs. IRS, has required the U.S. to pro- duce an index of 52,000 pages of documents. Boston attorney Michael Flynn, who helped Scientology victims from 1979 to 1987, personally endured 14 frivolous lawsuits, all of them dismissed. Another lawyer, Joseph Yanny, believes the church "has so subverted justice and the judicial system that it should be barred from seeking equity in any court." He should know: Yanny represented the cult until 1987, when, he says, he was asked to help church officials steal medical records to blackmail an opposing attorney (who was allegedly beaten up instead). Since Yanny quit representing the church, he has been the target of death threats, burglaries, lawsuits and other harassment. Foreign governments have been moving even more vigorously against the organization. In Canada the church and nine of its members will be tried in June on charges of stealing government documents (many of them retrieved in an enormous police raid of the church's Toronto headquarters). Scientology proposed to give $1 million to the needy if the case was dropped, but Canada spurned the offer. Since 1986 authorities in France, Spain and Italy have raided more than 50 Scien- tology centers. Pending charges against more than 100 of its overseas church members include fraud, extortion, capital flight, coercion, illegally practicing medicine and taking advantage of mentally incapacitated people. In Germany last month, leading politicians accused the cult of trying to infiltrate a major party as well as launching an immense recruitment drive in the east. Shortly after Hubbard's death the church retained Trout & Ries, a respected, Connecticut-based firm of marketing consultants, to help boost its public image. "We were brutally honest," says Jack Trout. "We advised them to clean up their act, stop with the controversy and even to stop being a church. They didn't want to hear that." Instead, Scientology hired one of the country's largest p.r. outfits, Hill and Knowlton, whose executives refuse to discuss the lucrative relationship. "Hill and Knowlton must feel that these guys are not totally off the wall," says Trout. "Unless it's just for the money." One of Scientology's main strategies is to keep advancing the tired argument that the church is being "persecuted" by antireligionists. It is supported in that position by the American Civil Liberties Union and the National Council of Churches. But in the end, money is what Scientology is all about. As long as the organization's opponents and victims are successfully squelched, Scientology's managers and lawyers will keep pocketing millions of dollars by helping it achieve its ends. Two Scientologists who operate there are Kenneth Gerbino and Michael Baybak, 20-year church veterans from Beverly Hills who are major donors to the cult. Gerbino, 45, is a money manager, marketmaker and publisher of a national financial newsletter. He has boasted in Scientology journals that he owes all his stock-picking success to L. Ron Hubbard. That's not saying much: Gerbino's newsletter picks since 1985 have cumulatively returned 24%, while the Dow Jones industrial average has more than doubled. Nevertheless Gerbino's short-term gains can be stupendous. A survey last October found Gerbino to be the only manager who made money in the third quarter of 1990, thanks to gold and other resource stocks. For the first quarter of 1991, Gerbino was dead last. Baybak, 49, who runs a public relations company staffed with Scientologists, apparently has no ethics problem with engineering a hostile takeover of a firm he is hired to promote. In the 1960s and '70s, L. Ron Hubbard used to periodically fill a converted ferry ship with adoring acolytes and sail off to spread the word. One by one, countries -- Britain, Greece, Spain, Portugal, and Venezuela -- closed their ports, usually because of a public outcry. At one point, a court in Australia revoked the church's status as a religion; at another, a French court convicted Hubbard of fraud in absentia. In France it took a death to spur the government into action: 16 Scientologists were indicted last year for fraud and "complicity in the practice of illegal medicine" following the suicide of an industrial designer in Lyon. In the victim's house investigators found medication allegeally provided to him by the church without doctor's prescription. Among those charged in the case is the president of Scientology's French operations and the head of the Paris-based Celebrity Centre, which caters to famous members.